Posted on Wednesday, June 13th, 2012 at 8:00 pm. 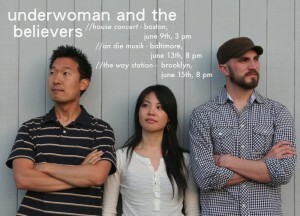 Underwoman and the Believers, fronted by Taiwanese American singer-songwriter Carolyn Chen, will be performing June 13 in Baltimore, Maryland. This gig just might be a favorite because there will be a grand piano provided, and it will be held at a record store – how cool is that? While this not-for-profit venue will require you to pay a mild admission fee, it will be worth it!